Today was the end of our tiny trig unit. Students worked on using trig to find areas of regular polygons that they hadn’t been able to find before (nonagons, pentagons, etc.) and did a group activity that I call a Roundtable. There are up to four members of each group and all start with a very similar problem. The first step is very simple and after everyone is done, they all pass their papers clockwise in the group. The next step will have something to do with what the person did before them, so they have to not only check the work from before, which could lead to great discussions, but they also have to continue with the problem. You will find two versions in the file below – one for a pentagon and one for an octagon. To challenge some groups that finished quickly, I asked them to check their answer using the similarity ratio before I check their final answers. They seemed to like being able to check themselves and I heard awesome discussions. I am also attaching a picture of some students’ work on angle of elevation/depression problems that they did on the board. I introduce these with statements like “Guys, these are all gonna be word problems *listen to groans* but word problems are the best ones to show your creativity! We’re leaning a ladder against a house here – look at how nice my dream house is! 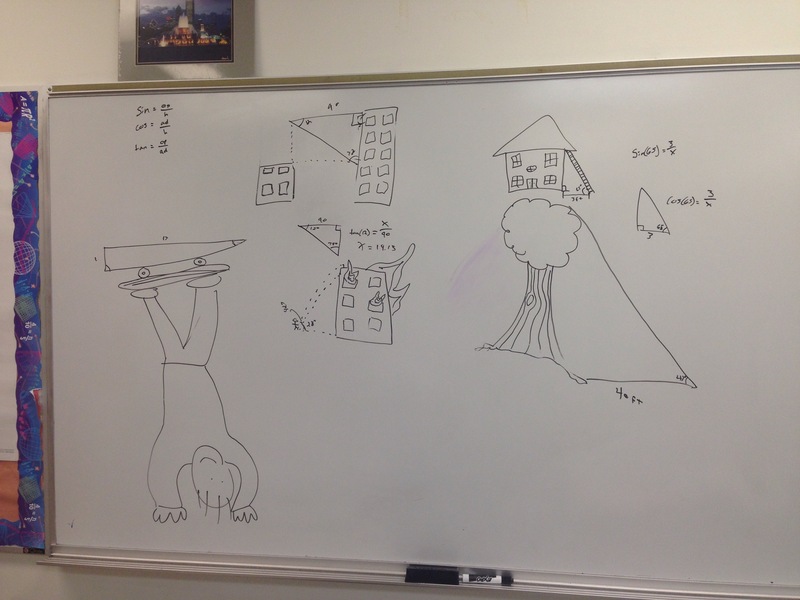 *takes a little too much time to draw a nice house with a ladder leaning on it in front of class*” Now most of my students actually draw out what they’re seeing. It might waste some time but I feel it gets a little more investment out of the ones who would normally shut down to a word problem. They also did a row game last class that I forgot to include. Basic trig stuff, but once again I think the students like being able to check their own answers and that’s what the row game gives you. Download below. Les réponses données encouragent les étudiants à essayer plus.